Our annual Christmas Concert will be Sunday, December 9, 2018 at the Youkey Theatre in the RP Funding Center. Doors open at 1:15, pre-show at 1:45, and the band concert begins at 2:30. The concert is free and no tickets are needed. The Center has a parking fee. The Christmas Concert will feature music from “The Nutcracker,” favorite Christmas carols, Rudolph and Santa, sleigh bells and jingle bells, and a carol from Mannheim Steamroller. We will be joined by not one, but two wonderful vocalists — Ken Brady and Rebecca Renfroe. Plus a chance for your kids and grandkids to join us on stage to conduct the band! Before the concert, enjoy the Licorice Sticks in the lobby, featuring the Band’s clarinet section. The pre-show will feature Slide Dish, a group of local trombone players who will serve up savory holiday treats. Sing along with your favorite carols and pop songs. 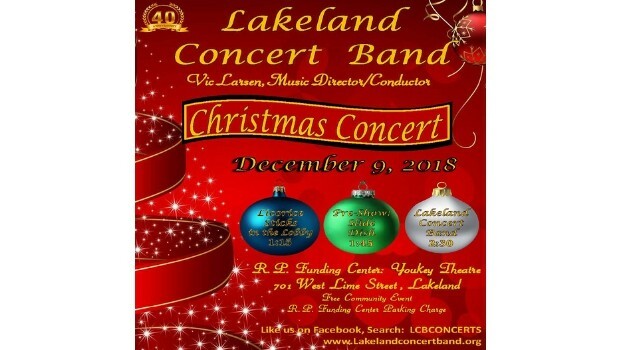 The Lakeland Concert Band entertains and inspires Polk County area residents with free concerts. Concerts begin at 2:30 p.m. Before each concert, we showcase local talent with a pre-show at 1:45 p.m. Concerts are free and no tickets are needed. We are an all-volunteer band with musicians of all ages, from teens to 90s. We have members who played in the military service bands of our country. We have many music teachers and professional musicians. Business owners, school teachers, medical professionals, and many others come together to make music for you.